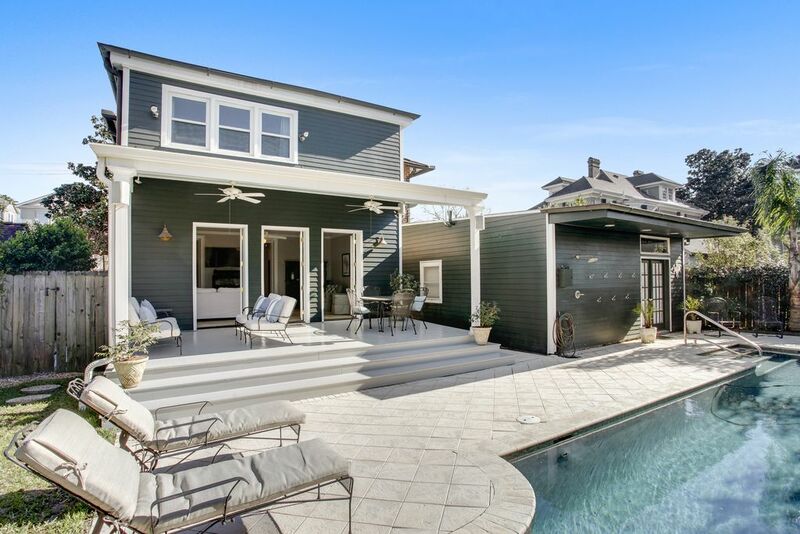 Find the latest and hottest real estate news right here. 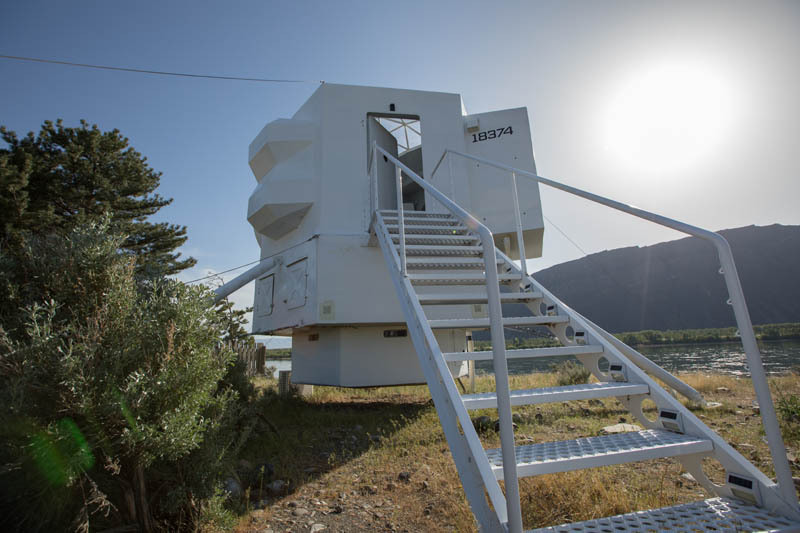 Ground control to Major Tom: Here's a home unlike any other we've seen. 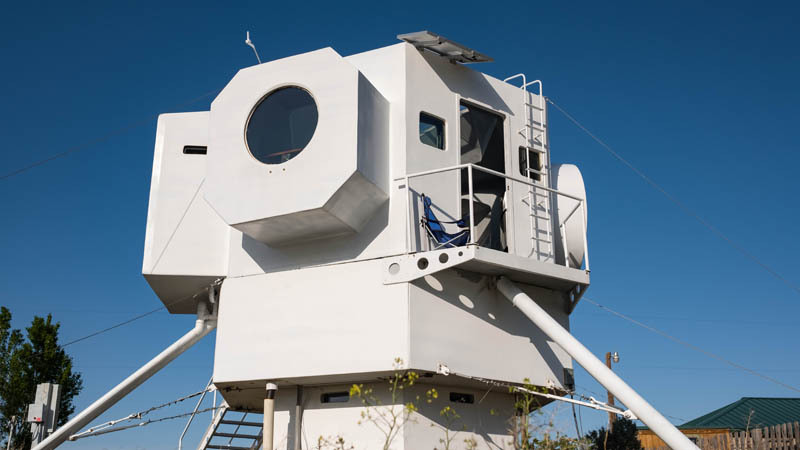 A lifelong architect went intergalactic to find inspiration for one of his latest designs: a tiny home shaped like a lunar lander. 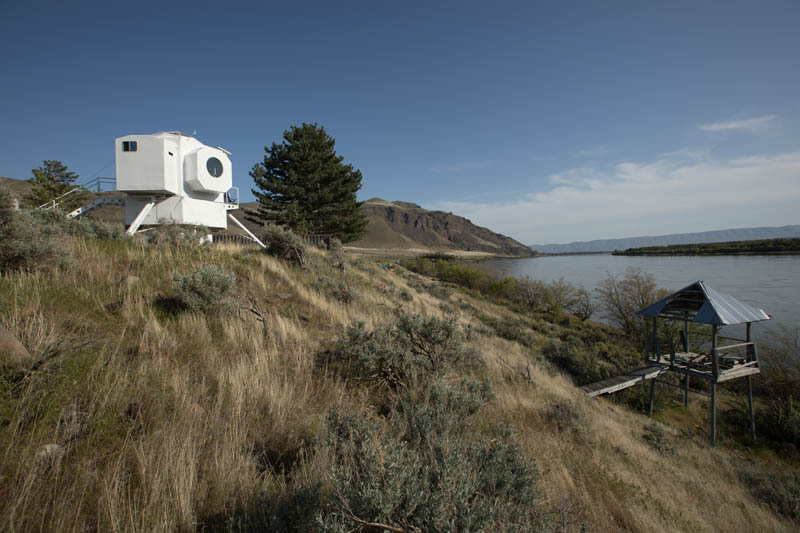 Nestled on the banks of the Columbia River in central Washington, the roughly 250-square-foot home is hexagon-shaped, perched nearly 9 feet above the ground on three massive steel beams. Inside, earthlings are greeted by an open floor plan. 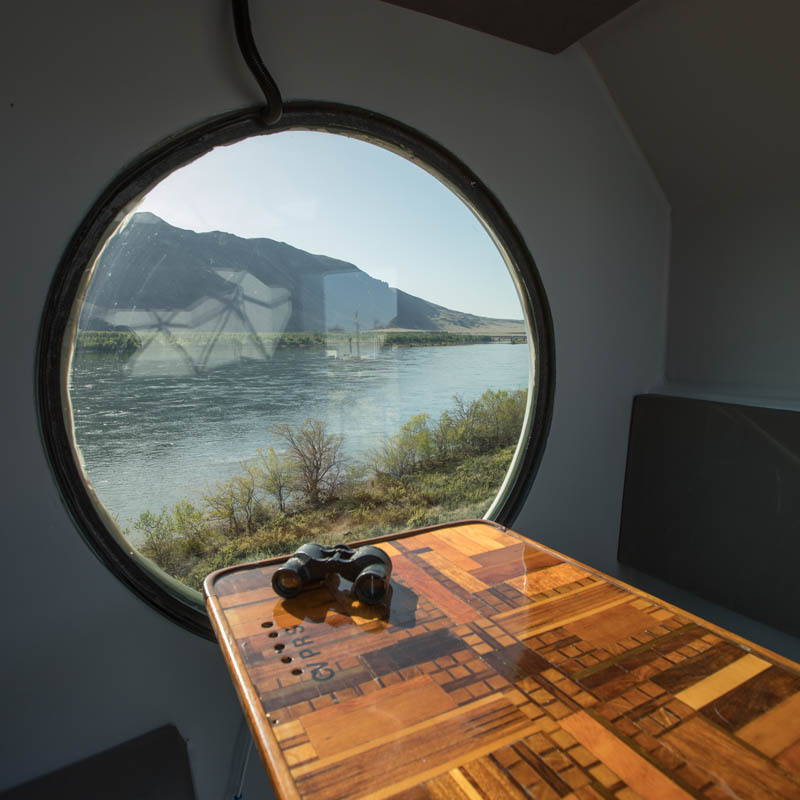 A breakfast nook has a porthole-shaped window overlooking the river and the hillside; a kitchen with stainless steel appliances provides space to cook up a feast for an astronaut. 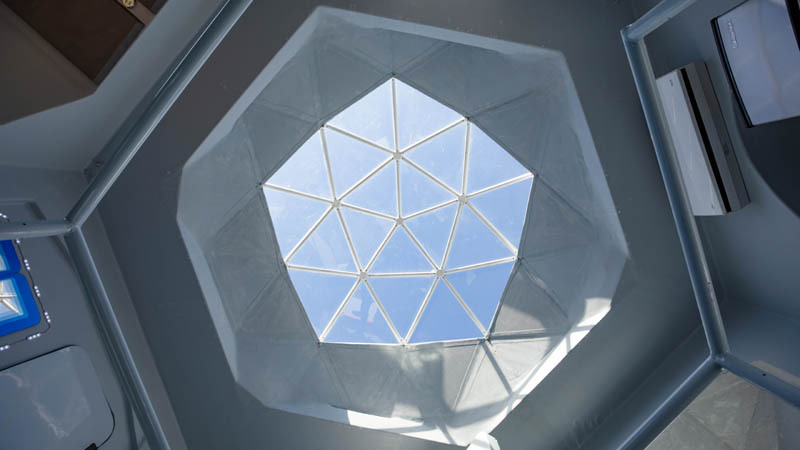 A large geodesic dome skylight showers the room with sunlight. Just off the bathroom, a deep-blue sink and cerulean-colored mirror have a Mid-Century Modern feel (appropriate, considering humans first walked on the moon in 1969). 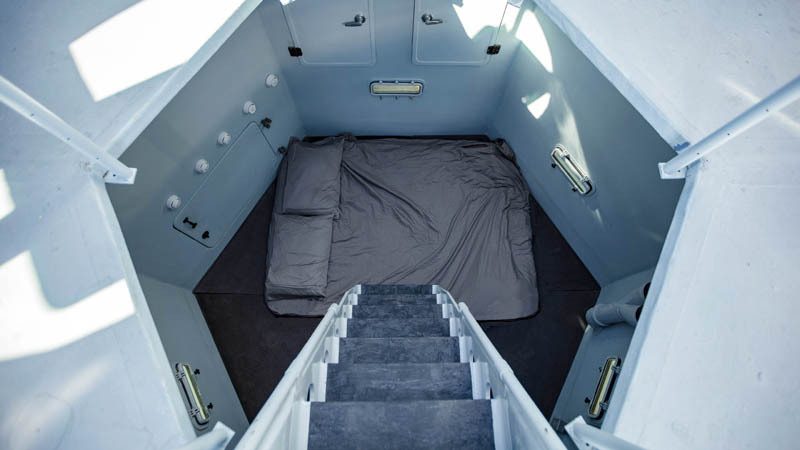 The bedroom sits below a small ladder and can comfortably sleep two people. Upstairs, there's enough room for a small outdoor deck where you can gaze at area wildlife, including eagles and lynxes. 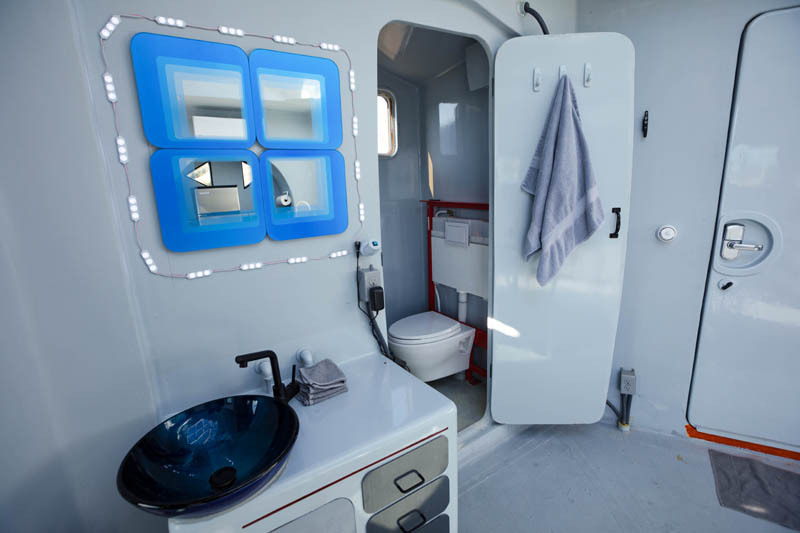 If the space reminds you of the tiny well-intentioned living quarters of a boat, it's no coincidence. The lunar lander's owner and designer, Kurt Hughes, is a boat designer by trade. 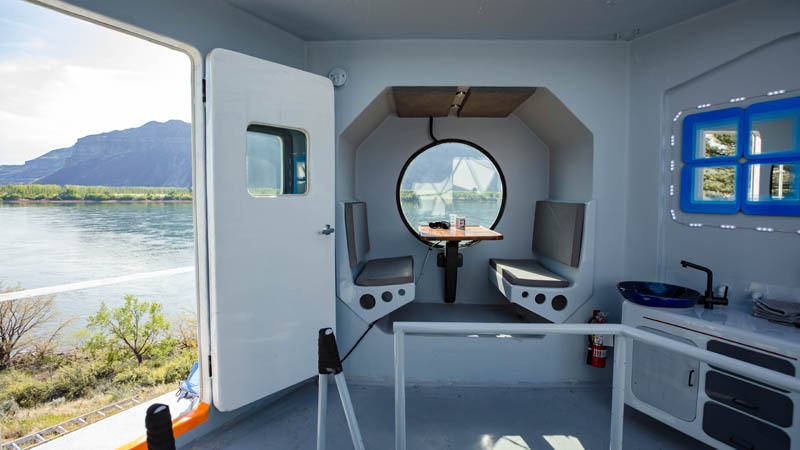 He translated his three decades of boat building to home building - in fact, the wooden table in the dining nook is recycled from the Hughes' first sailboat. Photos by Zillow’s Marcus Ricci. Jonathan Fay lives a double life. By day, he works in software engineering, but once the sun goes down, he opens a window to the heavens - right in his own backyard. 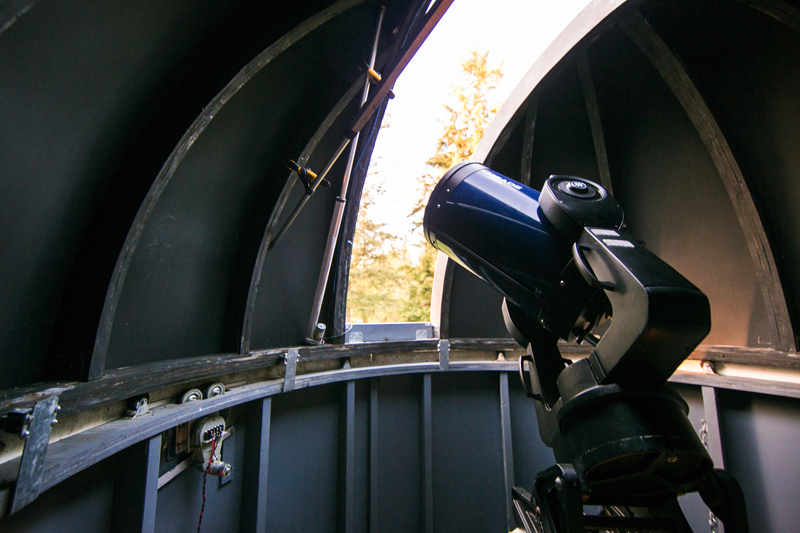 My observatory is a place of peace where I can collect my gear and spend time with the universe. 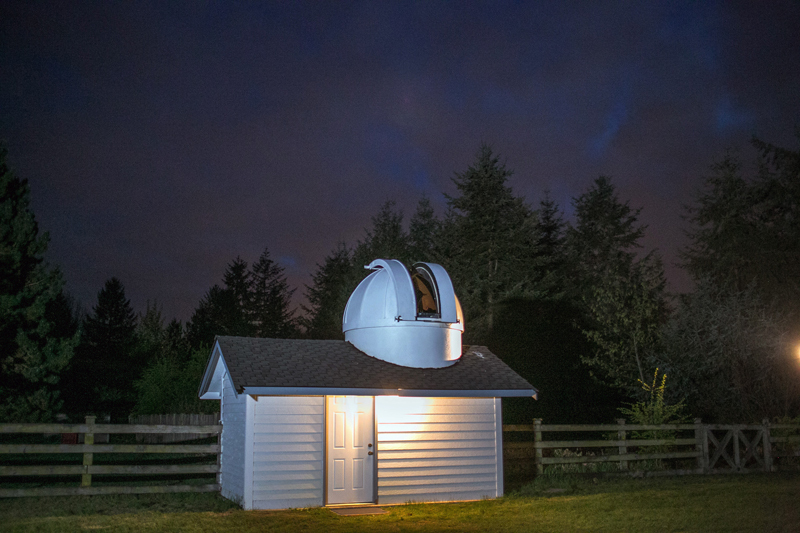 The nature of astronomy in the Pacific Northwest is challenging, but I’m able to open the dome and start observing without having to set up ahead of time and rush to cover things up when it rains. What do you like best about the physical space? It’s separate from the activity of my home, and it’s quiet. I don't disturb anyone else, and they don't disturb me. What's your home like? Is your sanctuary an extension or departure from your home? Our home is a two-story wood and brick home. The observatory blends nicely with the house and barn in style, but the dome clearly sets it apart. Did you have your sanctuary in mind when you chose your home? No. A few years after I moved in, I realized I needed a more permanent place than a second-floor porch off the bedroom to set up my new telescope. What was the tipping point that made you decide to create a sanctuary? When I would do astrophotography imaging runs on the second-floor porch, people would turn on lights or walk around, and the light and vibration would ruin the image. My wife didn’t like having to shut down her life for my hobby. How did you build your sanctuary? I designed and built the observatory. I had some occasional help from friends when I needed lifting or a second pair of hands. I also had help from my kids handing me screws and nails while I worked. What was the biggest challenge in creating your sanctuary? Round stuff is hard. Especially when it has to rotate and be level. The dome was a hemisphere, so it was round in more than two dimensions. Woodworking tools are not optimized for round things. Has your sanctuary always looked the same, or has it changed over time? We recently added wood floors from carpet. And we put on a new roof when we re-roofed the rest of the buildings on the property. How much time do you typically spend in your sanctuary? Sometimes many hours for several days in a row. Sometimes I go weeks without going inside. It depends on the ebb and flow of life - and how bad I need it. How did you get into astronomy in the first place? My aunt gave me a telescope when I was about 12. Since then I have loved space and astronomy, but when I could put a computer-controlled camera on a telescope, that made me want my own Hubble in my backyard. Does your hobby influence what you do professionally or vice versa? 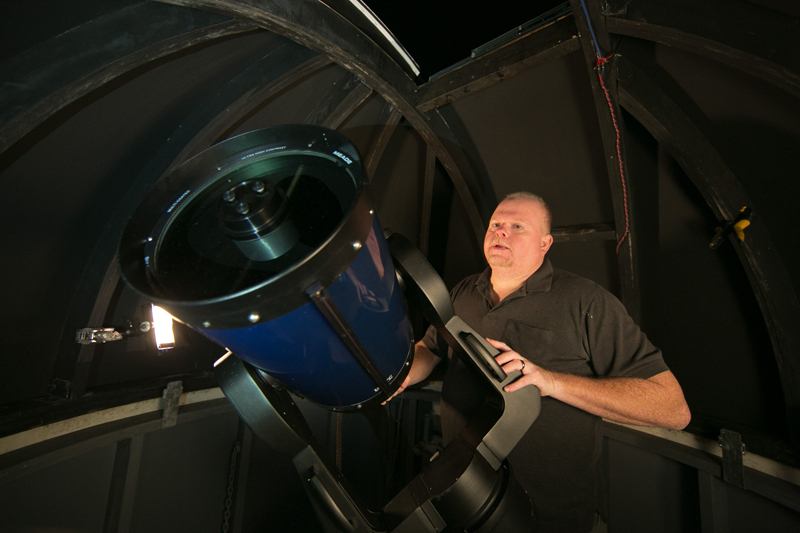 Building my observatory, writing all the software for it, and doing astronomical imaging helped me create the WorldWide Telescope project with two of my co-workers. Now millions of people can visit space on their computer or planetarium because of it. Do you share your sanctuary with anyone? What about your home? I will share the observatory with just about anyone who asks, and sometimes I invite people to join me. I share my home with my wife and five active kids. So sometimes a getaway is in order! If you had a do-over, would you change anything about your sanctuary? While I love the look of the dome, I would make the shutters open wider to accommodate a bigger telescope. Do you wish you had found your sanctuary sooner? It came at the right time for me, and I returned to update it when that time was right. 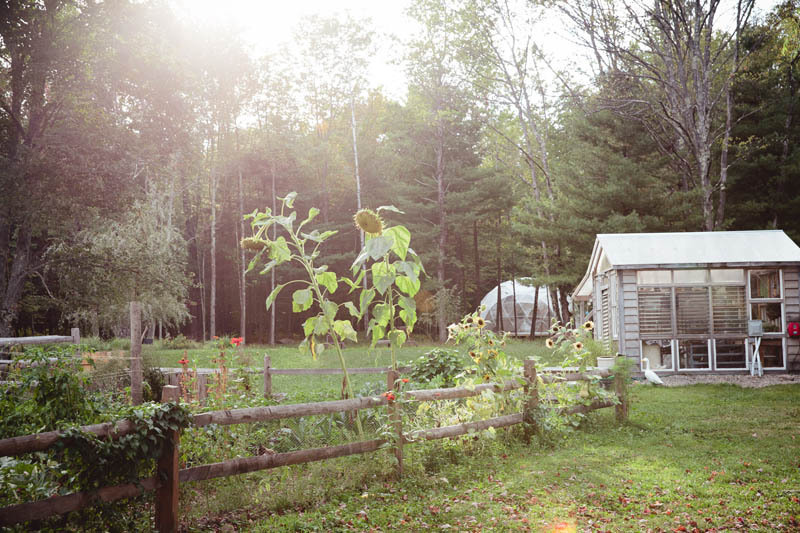 What advice would you share with those who dream of having a sanctuary someday? You’re not getting any younger. Just go for it, even if you don't use it as much as you think you need to to justify the cost. It will always be a great story to share. 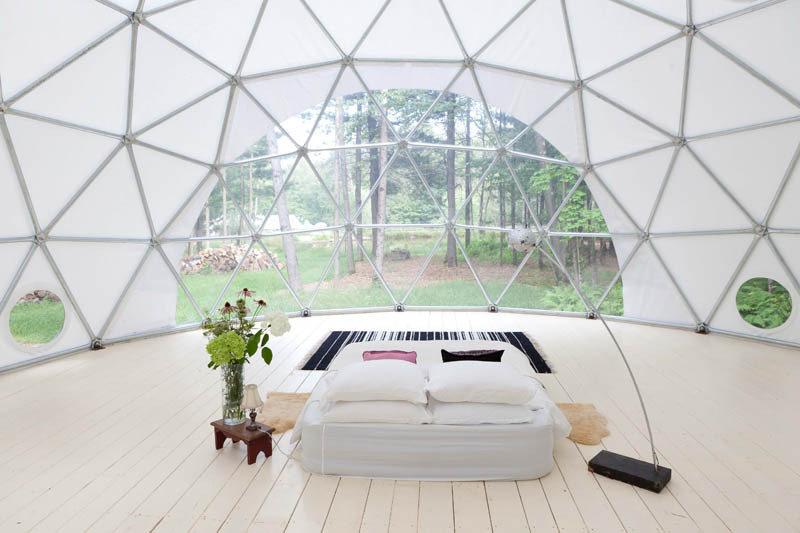 It's an appropriate question to ponder while gazing at the forest from inside this unusual dome home in upstate New York. 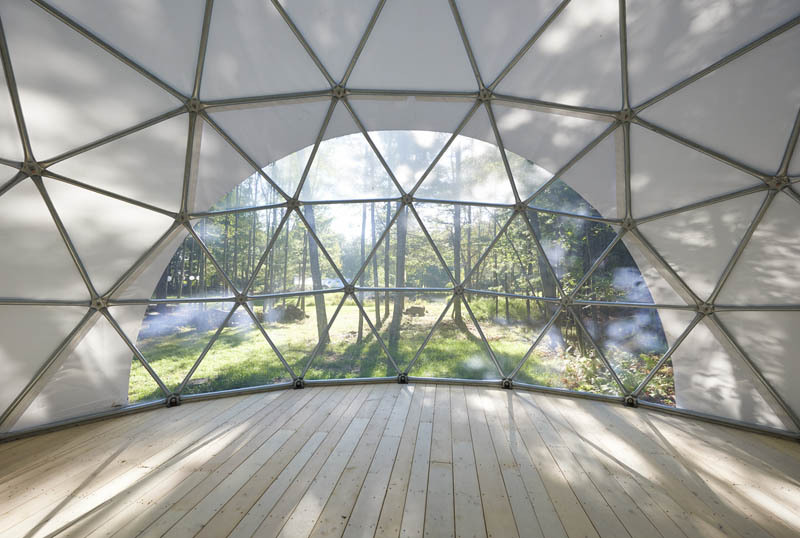 Made to maximize views while maintaining partial privacy, this geodesic bubble tent is equal parts glamping destination and fishbowl. It's the perfect place to observe nature without fully immersing yourself in it. Copyright 2018 Leon Cato Photography. 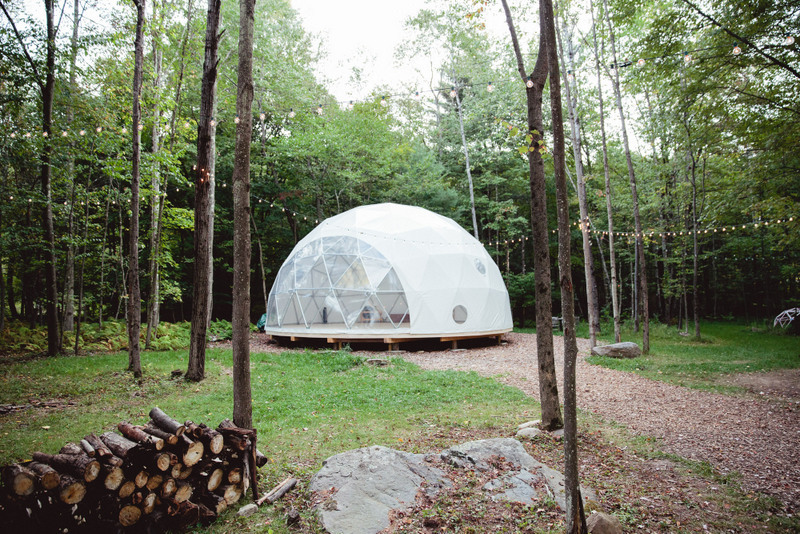 Tucked away on a farm in Woodridge, New York, the dome is surrounded by a thicket of trees and sits just feet away from a greenhouse, a vegetable garden and a pond. Ample windows offer views of the natural environment, and screened-in panels allow airflow but deter mosquitoes in the summertime. Still looking to bask in nature? 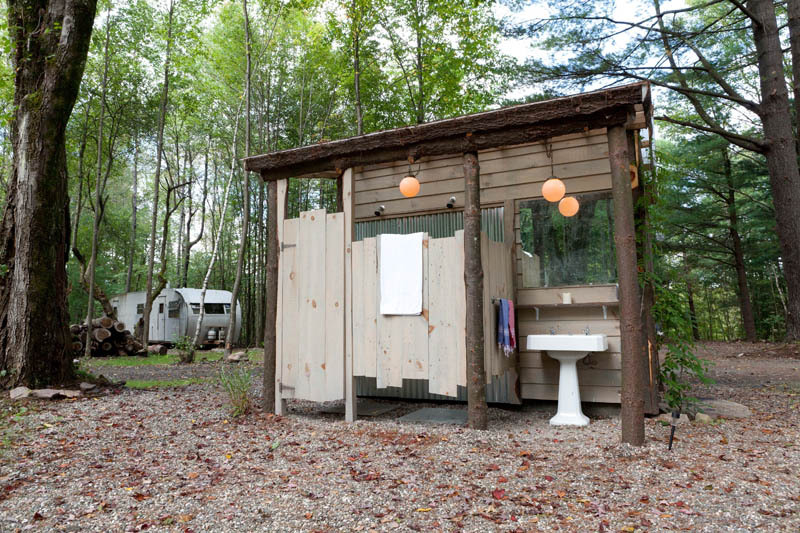 Two outdoor showers and a clawfoot tub allow you to scrub and soak near the sugar maples. 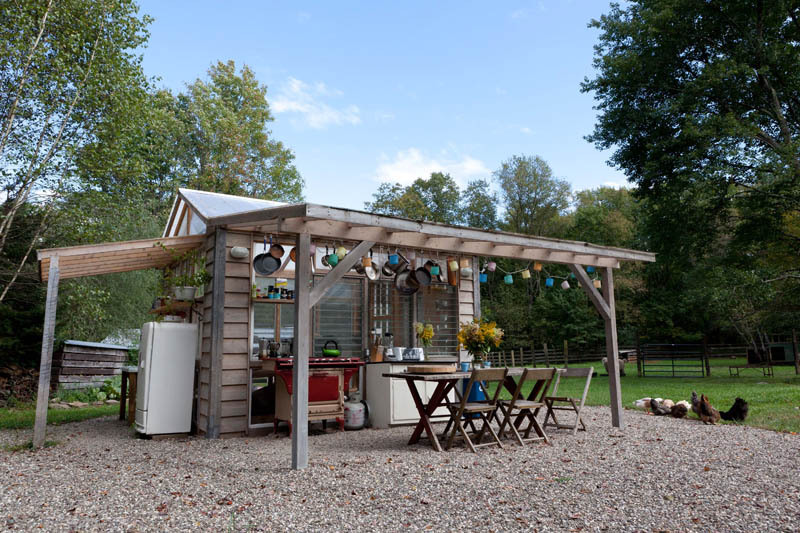 An open-air kitchen and grill offer up the chance to dine alfresco. 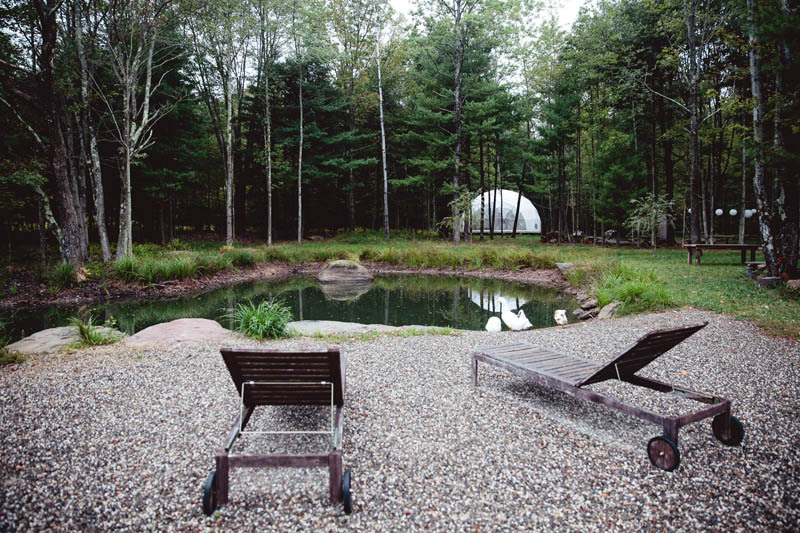 The home is currently available as a short-term rental in the Catskill Mountains, roughly 95 miles from the heart of Manhattan. Bonus: Guests can interact with animals on the property (hello, goats!) and enjoy a recording studio, hiking trails or a weekly yoga class. Top featured image by George Apostolidis (portfolio, Instagram). Have you ever ended up with a bed of dead flowers, mountains of mulch and a whopping garden center receipt? Let's do something about that, shall we? Give your unplanted bed the once-over. Does it get enough sunlight? Does water tend to collect there? Have you removed all weeds, roots and rocks so your plants will thrive? It's a lot easier to fix these problems now than it is once you’ve planted the flowers and laid the mulch. Since some seeds transplant poorly, check the packet and make sure you don't have to sow directly in the ground. Start seeds in trays, pots or coir pots, using a seedling mixture, place them in a sunny spot, and transplant as soon as they have developed sturdy stems. Pack them closely in your car to avoid damage, and take them home immediately so that they don't fry in your car during other errands. 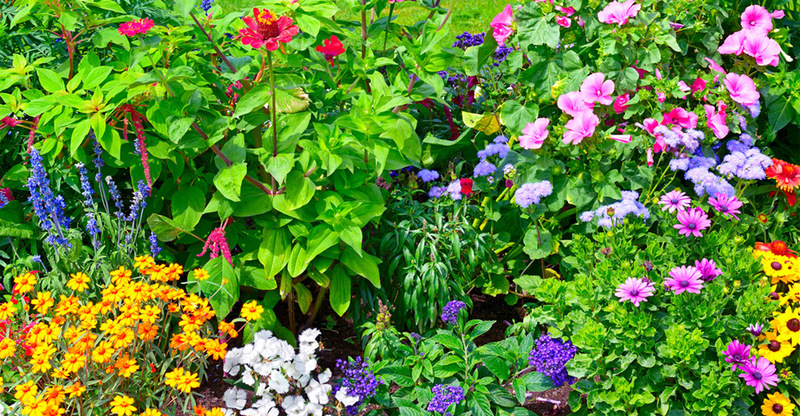 Choose annuals if you plan on replacing them in a season or two, and plant perennials if you'd like them to last longer. Plant evergreen shrubs or ornamental grasses to provide structure and year-round interest. Also consider the plant's eventual height. Plant low-growing flowers (usually annuals) at the front of the bed where you can easily view them and replace them at the end of their season. Dig each plant's hole to be twice as wide as the original pot so the roots will have plenty of room to grow. To give them an even better head start, make a little trench around the inside of the hole so the roots will spread down and out. This step isn't necessary for annuals, since they won't be around long enough to enjoy their strong root systems, but it is helpful if you have clay soil. Mulch is essential for conserving moisture and preventing weeds, but one inch is all you need. Established garden beds don't even need mulch because the plants themselves are capable of protecting the soil. Mulches vary by region, but whichever kind you use, follow this one rule: Don't ever pile it up against the plants. They'll rot in no time, and you'll soon have nothing more than an ugly bed of mulch in their place. Outdoor showers may seem like a luxury - something that only those with beach houses would need or be lucky enough to have. But an avid gardener, runner or someone that enjoys the freedom of bathing in nature, you may consider an outdoor shower for your own home. This is one of the most important considerations. It’s best to choose a spot that you use often. In most cases, anywhere near the back entrance to your home is a good choice - maybe adjacent to the back door or on the back deck. If you have a pool, situate the shower nearby for easy rinses before and after swimming. Privacy is a fairly important consideration, unless you think only swimsuit-clad people will use the outdoor shower. 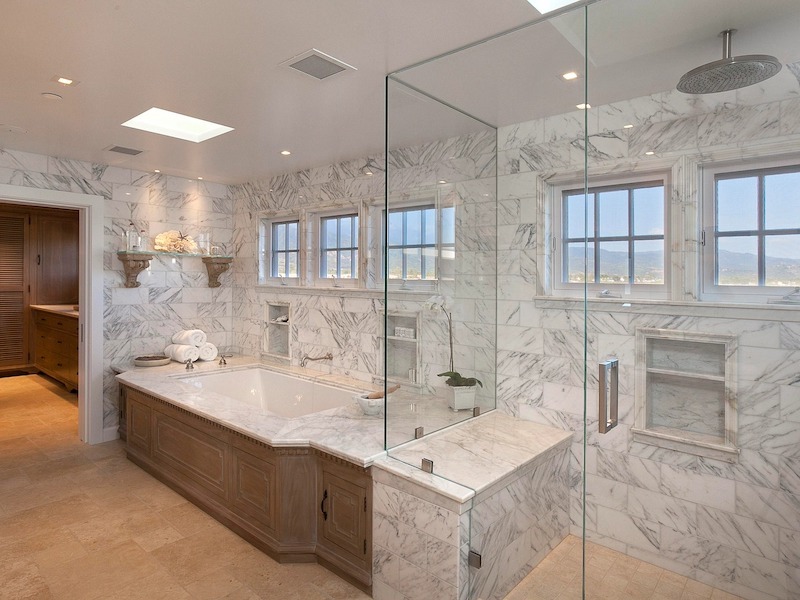 You want the shower to feel private and far from prying eyes, but you also want to keep the natural feeling. 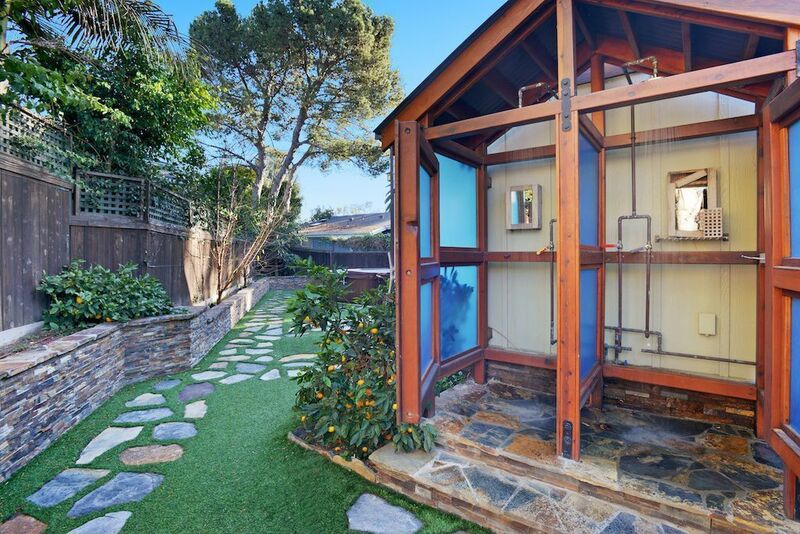 The most elaborate - and most expensive - is the plumbed-in outdoor shower. This is worth investing in if you anticipate consistent outdoor showers and not just cleaning up after a hot day in the sun. The only downside to this option: If you live in an area with freezing winters, you have to make sure you can fully drain and insulate the plumbing so it doesn't burst. The simplest and most common drainage system is letting the used water drain into your yard. If you don't have very porous ground in your yard, or if the outdoor shower is close to your home, consider attaching the plumbing to your home’s drainage pipes or installing a French drain (essentially a gravel-lined channel connected to a pipe that directs water to a drainage area). Incorporate affordable accessories that add to the fun and pleasure of showering outdoors. A large rainfall showerhead enhances that outdoor feeling, and plants or flowers in the shower area or peeping through the enclosure add a whimsical touch. With just a little planning and effort, you can install your own outdoor shower and stay cool during the sunnier months. Originally published June 26, 2017. A good spring shower leaves the earth feeling refreshed and renewed - which is not unlike a good shower in your own home. 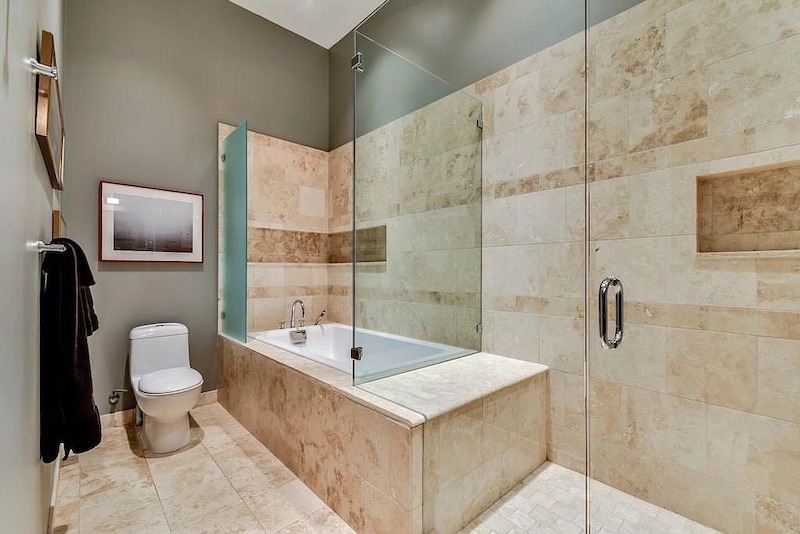 A well-designed and polished bathroom can invigorate you in the morning or relax you before bed. These 10 bathrooms in for-sale homes across the country give us that feeling of rejuvenation - and make us just the tiniest bit envious. 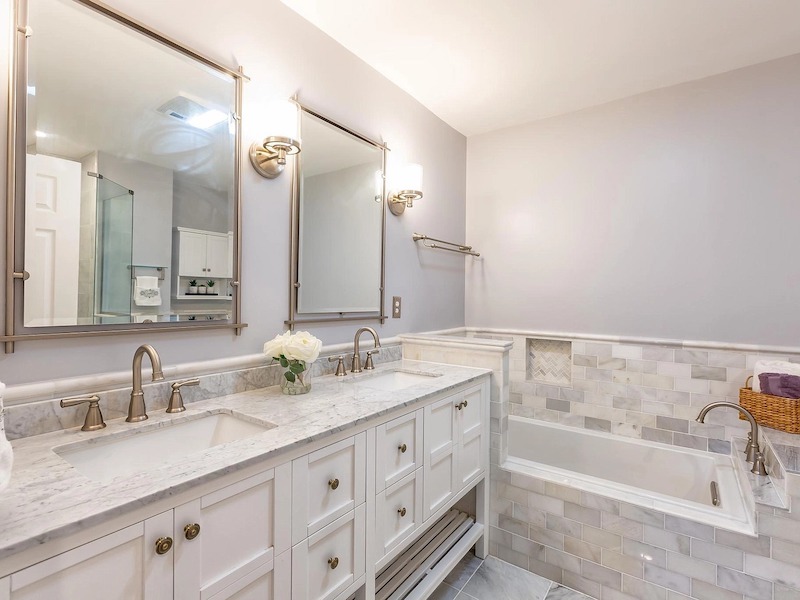 This Tudor revival in Washington, D.C., is equal parts modern and traditional - and its sleek yet comfortable bathroom is exactly what you’d need after a long day in this busy political city. 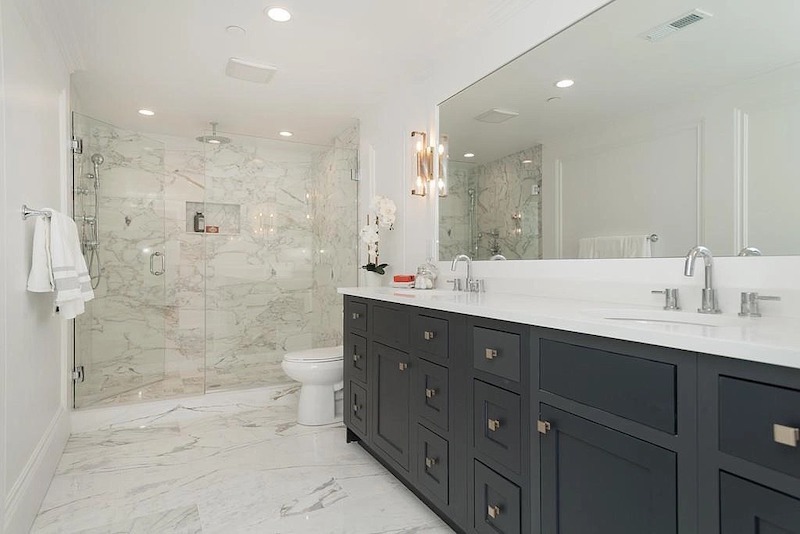 This bathroom has all the spa features of your dreams, including a soaking tub with ample space for bath supplies, a double vanity with tons of storage underneath and a neutral, calming color palette. 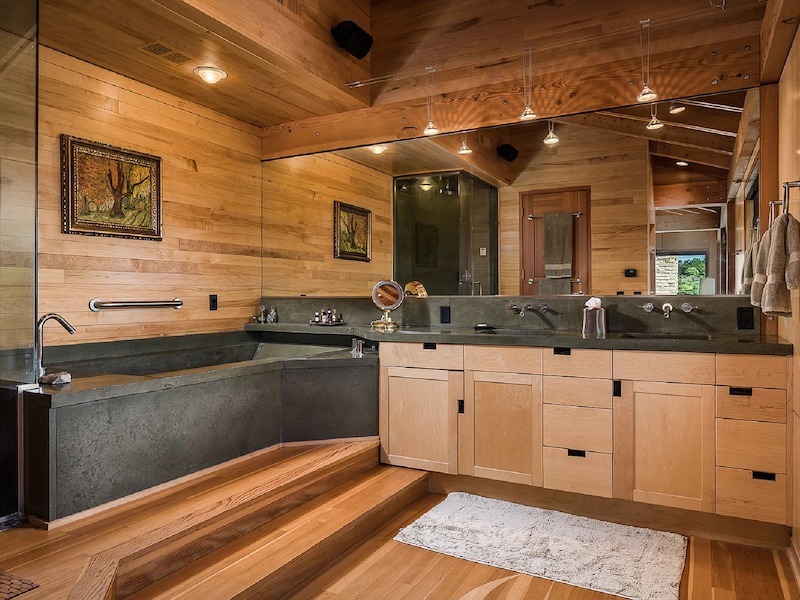 This stunning home in De Soto, Wisconsin, is an award-winning architectural structure, but the bathroom is by far the dreamiest of all its spaces. 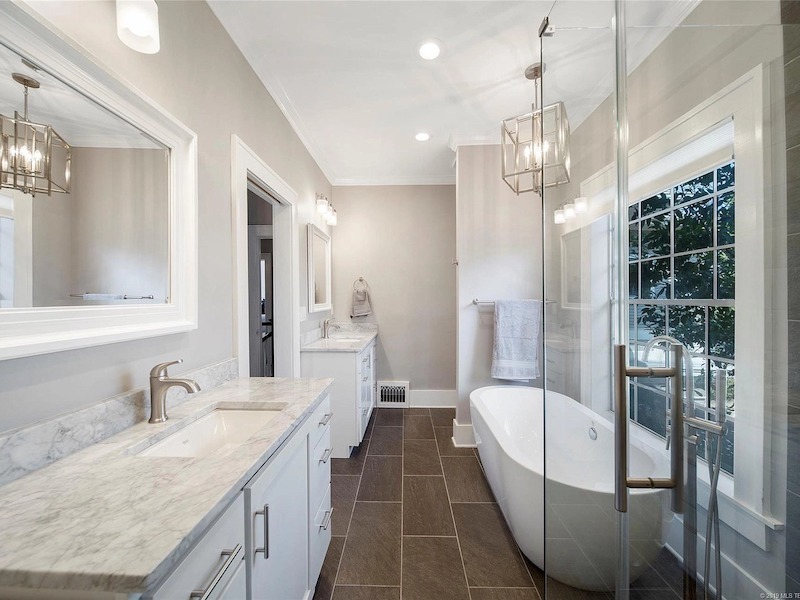 The light hardwoods and paneling contrast beautifully with the slate-gray tub and vanity countertop, and the lighting gives just enough ambience without being too overpowering - perfect for taking a midafternoon soak in the tub on a Saturday. 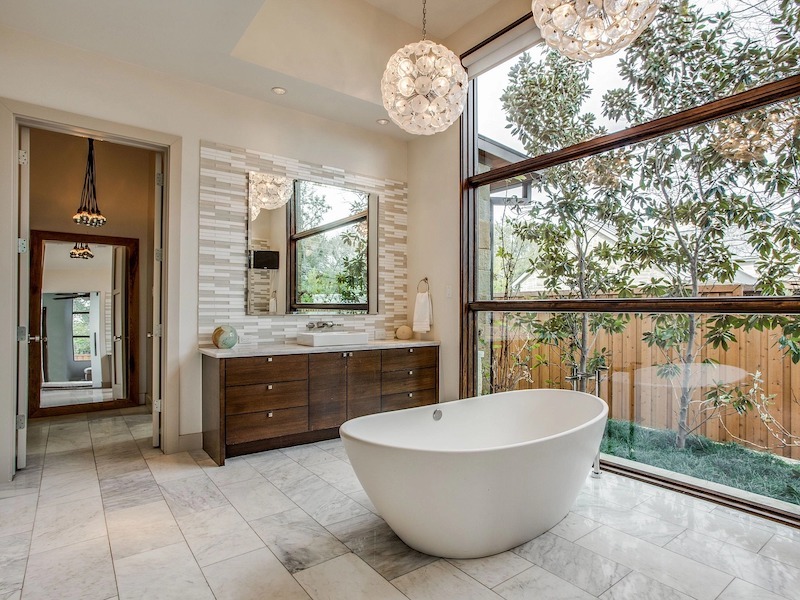 This bathroom in Austin, Texas, blends neutral tones and contemporary glass to instantly relax you - and add a huge dash of style. 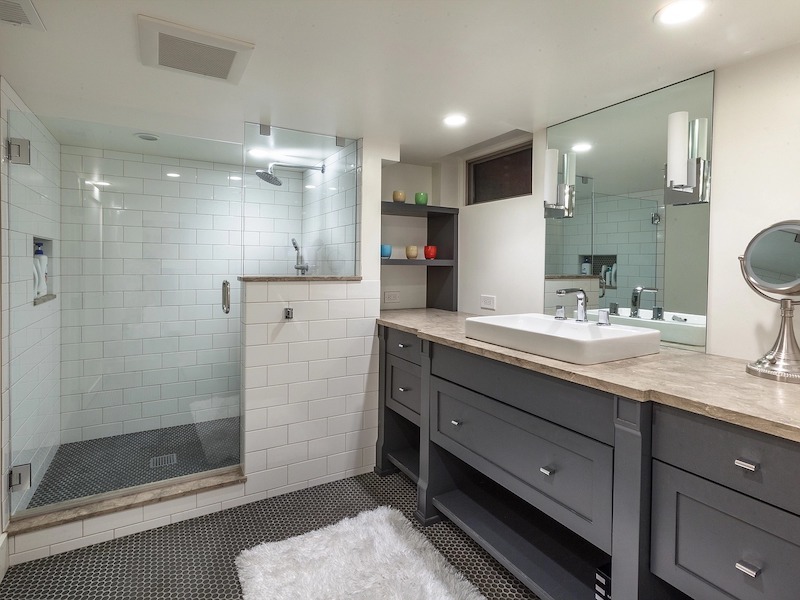 A deep soaking tub connects seamlessly to the oversized glass-encased shower, which has a large bench and built-in shelf for bath products. 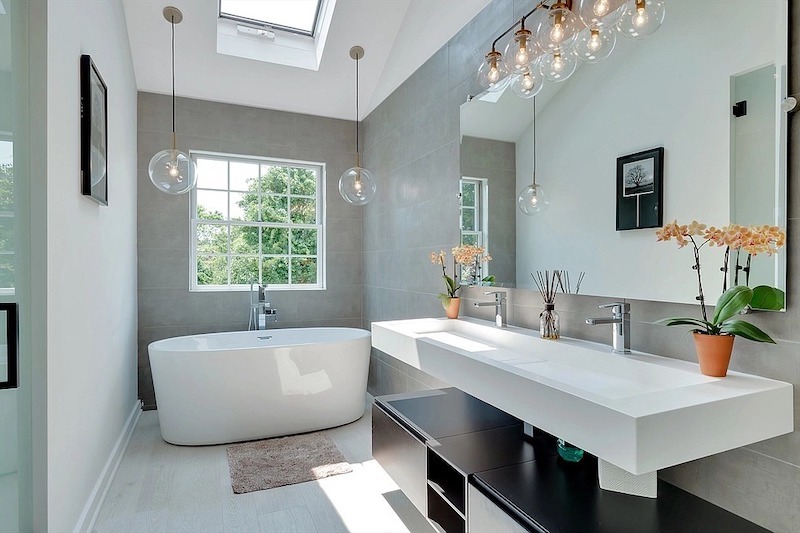 The light fixtures in this East Hampton, New York, bathroom are reminiscent of bubbles - appropriate for a room with a free-standing soaking tub. Another set of bubble lights sits above the wall-mounted modern sink with plenty of storage underneath. Fold-up tables (attached to the wall or stand-alone) offer extra space when needed. If there's room, a butcher block or island instantly create food prep or storage space. Another simple way to create space? Pare down your belongings - especially on the counters - and only keep the necessities. 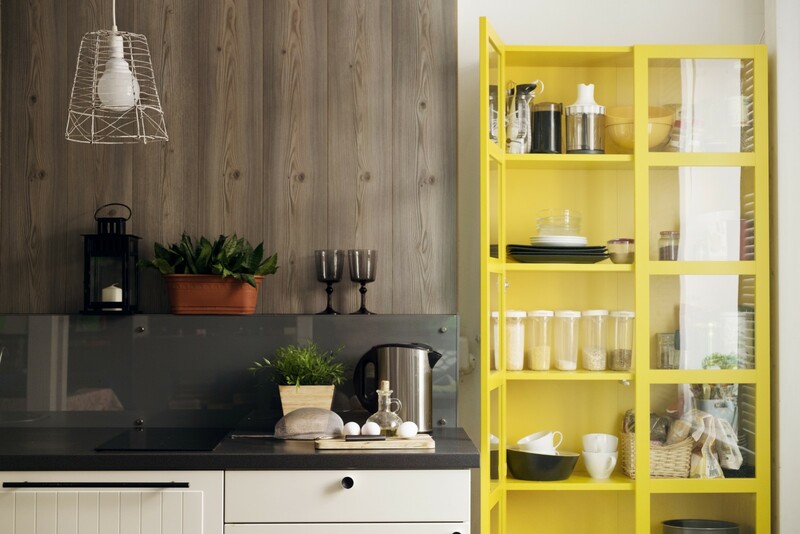 Small bookcases are a kitchen's best friend. They are perfectly narrow, they come in many heights and they offer tons of storage options. When using every inch of space, don't forget to leave room for a few decorative elements. Hang attractive tea towels with pushpins for a practical splash of color. And fresh flowers on a shelf or table instantly brighten the space and add life. If you can direct your lighting, such as track lighting, make sure it points to the kitchen triangle - that well-worn path from the stove to the sink to the refrigerator. If overhead lighting is scarce, consider using table lamps and even floor lamps. A floor lamp in a kitchen might seem odd at first, but put it at the end of a counter or tucked behind a table, and you'll be grateful for the extra light. Renting a home with other people can be stressful. But with careful planning and clear communication, living with others doesn't have to lead to passive-aggressive notes and arguments. What matters most when sharing closet space is equality. No, you don't need to make a line with tape on your closet floor (please don't). But you should stick to your designated areas. Hang vertical cloth shelves in the middle to store your shared towels and extra sheets, while also creating a closet divider. And when you toss your shoes in the closet, make sure they're on your side. Maximize the cabinet space you're given by adding stackable wire shelving racks. In the kitchen, they’re great for storing plates on top and bowls below. And under your sink, you can put extra sponges, cleaning rags and garbage bags below with your cleaning spray bottles up top. Storage bins and plastic stackable boxes can also save the day - especially when it comes to bathroom storage. Put your skincare items in one and your dental products in another. These stackable boxes come in all sizes - the ones with more depth can fit your bulkier products, and the shorter boxes are better for smaller items, like your travel-size products. Once you place those stackable wire shelves in your kitchen pantry, you'll soon learn that labels and plastic bins rule. If you decide to share spices and other items like flour, vegetable oil and cooking spray, try arranging them in bins with labels that say "Shared." Use more labels to mark shelves and bins with each roommate’s name, if you think you'll all need the reminder. 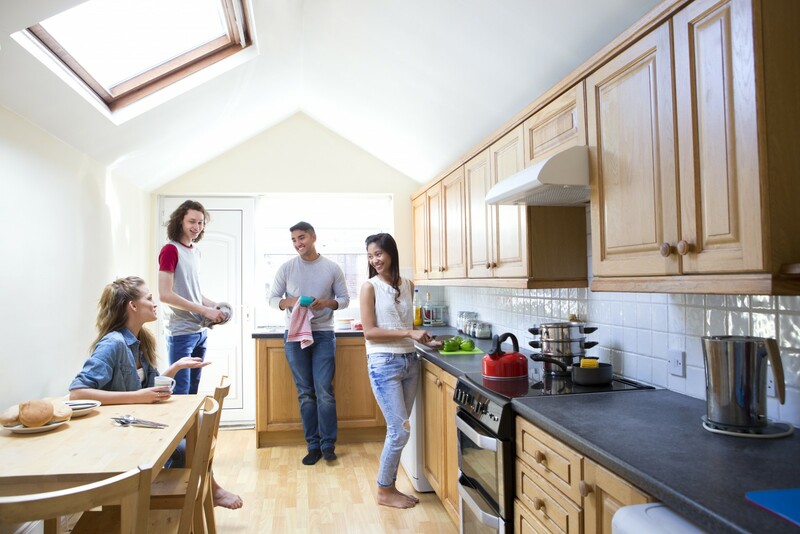 Decide with your roommates if it’s OK to keep items on the kitchen and bathroom counters. It may seem silly to discuss countertop space, but you'll be glad you did. Decide how many and which items you agree to allow on the counters. Does the toaster that you never use drive your roomie crazy? Are you okay with your BFF's curling iron always being on the bathroom counter? Air out your countertop pet peeves - you can always find ways to avoid potential disagreements. The key is deciding as a team in advance what's fair - and sticking to it. If one of you has a pet, how do you decide where the crate, toy basket, and food and water bowls go? It may make sense to put pet items in common areas, but the pet owner shouldn't assume all roommates are cool with squeaky toys all over the living room floor - no matter how cute that pup is. Just like you'd pick up your things from the living room, you'll want to pick up Fido's stuff too. Don't hang your art in common areas without getting your roommates' opinions first. Turn decorating your walls into a roommate activity. Gather all the art and decorative wall items you want to hang, and have everyone choose their favorites. You can even turn it into a chance to get to know your roommates better. Have a cool story about where you got that tapestry? Got your favorite mural while studying abroad? Tell your roomies all about it - and listen to their stories too. They may be cool with your wall decor once they know the meaning it holds. If all else fails, stick with similar color palettes, and decorate based on shared color groupings. Remember that what doesn't go up in the living room can go up in your room. Adhesive hooks are great for hanging towels when you need extra bathroom space - or for hanging keys in the entryway. Use shoeboxes to store smaller items like scarves, winter gloves and cosmetics. Label them to make everything easy to find, and you can even decorate them with wrapping paper to pretty them up. Toilet paper rolls are an organizational lifesaver when you have too many cords. Designate each type of cord within one roll, and label them so you never mix up your roommates' cords with yours again. Under-the-bed storage containers are key for off-season clothing items or bulky boots that don't seem to fit anywhere else. Your roommate will thank you for the extra closet space. Fabric panels are an inexpensive way to divide a room for added privacy. Even if the people you live with are not quite as organized as you, rest assured that at least your belongings are contained on their shelves and in their assigned containers. Having smart shared spaces allows you to enjoy your time with your roommates without stressing over whose stuff is whose. Originally published September 9, 2016. Use a preemergent herbicide to stop warm-season weeds before they sprout. And even a weed-free lawn can easily be undone by nearby weeds and their traveling seeds, so remove any weeds in the garden now so they don't find their way into your lawn. If your lawn has bare spots, fill them in now with sod or seed so weeds don't sprout and get a foothold. Much like cars, lawnmowers will stop working without routine maintenance. If you haven't already done so in the fall, replace the mower's oil and gas with the types recommended in your mower's instruction manual. This would also be a good time to replace that corroded spark plug and dirty air filter. Add a fuel stabilizer to keep the gas from going stale and harming the mower's engine. You know that spongy layer of dead grass that builds up in your lawn? That's thatch. A thin layer of thatch is normal and even healthy, because it protects the soil, roots and beneficial organisms. But when that thatch gets about an inch tall, drought, weeds and other problems develop. Thatch is most likely to build up in lawns that have acidic or compacted soil - or lawns that have been excessively treated with herbicides and pesticides. If thatch is common on your block, prevent it with core aeration. This allows air to reach the soil, promoting organisms that naturally break down thatch. Use a vertical mower or power rake if the thatch is an inch thick or more. If your existing lawn is an annual one, remove it with a sod cutter. Perennial grasses, like Bermuda or St. Augustine grass, are much tougher to remove, so you'll likely have to either solarize with clear plastic sheets for several weeks or resort to an herbicide. If you're not already following a fertilizing schedule, start one now by following the directions on your product of choice. You will likely forget this schedule after the first feeding, so pencil in the dates on your calendar so you don't get off track. Start the season off right by mowing more often, on a higher setting and in alternating directions. Inspect your sprinklers and pipes for possible breakage - a patch of damp soil or an excessive water bill would be your first clue. If your lawn seems to let into the surrounding landscaping, start edging now to define your boundaries. Buying or selling a home rarely happens overnight, and it's not uncommon for buyers or sellers to interface or even work with multiple agents. Best-case scenario, the right agent shows their face early, and the relationship (and transaction) is a huge success. But somewhere along the way, you may find that your relationship with your real estate agent just isn't working anymore. Maybe the agent is moving faster than you'd like. Or they're not as available as you need them to be. Maybe they just don't get you. The answer depends on whether you're working with an agent as a buyer or a seller. Real estate agents earn their commissions from sellers, and the money is split between the sellers’ and buyers’ agents. As a general rule, buyers won't be asked to enter into a contractual or financial agreement with a real estate agent. Instead, a buyer makes a (sometimes nonverbal) handshake agreement with the real estate agent. You're basically agreeing to exclusively rely upon that agent. And that's fair. Agents often work hard and spend a lot of time engaging with buyers, watching the market, writing contracts, showing properties, reviewing disclosures and so on. Imagine how they'd feel after spending months working with a client only to be informed that another agent found them the home they want? If you're not quite ready to be tied down, it's better not to engage an agent until you are ready. Early on, a good real estate agent should read your situation well and provide the appropriate amount of attention as needed. They'll act as a resource and be available when you need them. Once the search kicks into high gear, agents and buyers will spend lots of time together and communicate 24/7. If you do find that a relationship isn’t working, be honest and upfront before more time passes. Offer the agent constructive feedback about why it's not working for you. Since the seller pays the real estate agent's commission, the brokerage requires the seller to sign a listing agreement upfront. During the listing period, you're contractually obligated to work exclusively with the agent and brokerage firm, specifically on the sale of your home. Just as a buyer must do their homework, it's even more important for a seller to do their research, given the commitment. Most listing agreements state that if the listing agent brings an offer at the listing price and the seller doesn't accept it, the agent is still due a commission. This scenario happens sometimes when the listing agent and seller aren't getting along. In most situations, if the listing agent isn't doing a good job but there's still time left on the agreement, you should simply tell them it's not working out. A good, fair and honest agent will apologize for not meeting your expectations and will agree to release you from the agreement ahead of schedule. But that's not always the case, and sellers typically respond by no longer agreeing to open houses or considering offers from the agent. Sometimes an agent wants to break up with the seller. Maybe the seller insists on keeping the price of the home too high or isn't cooperating to accommodate showings. The agent simply feels they can't be successful with the seller, no matter how much time they put into the job. If you're a seller whose agent wants out of the agreement because you aren't taking the necessary steps to sell your home, it's best to let them go - and decide if you're really ready to sell or not.